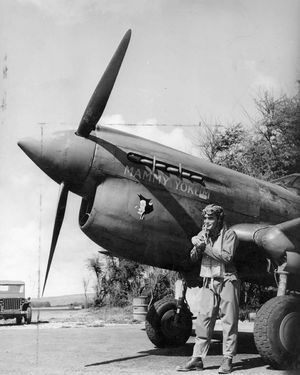 Bellows Field (1933-1958) - A United States Airfield first established in 1933 as Bellows Field at Waimanalo, Honolulu County, Hawaii. Named after Lt. Franklin Barney Bellows, a World War I war hero who was killed in action on 13 Sep 1918. Bellows Field was made a permanent military post in July 1941. 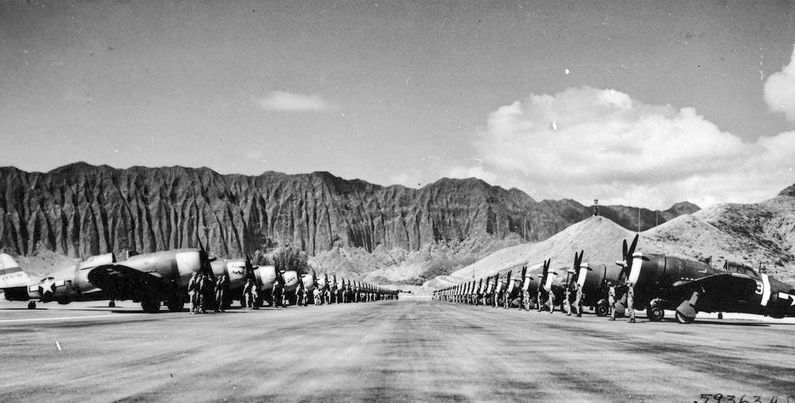 Renamed Bellows Air Force Base in 1949 and Bellows Air Force Station in 1958. Airfield closed in 1958. Now a Marine Corps training area and an Air Force recreation area. Bellows Field Maj N.K. Health, CO, by his ship Mammy Yokum c1940s. Bellows Field Flightline, Republic P-47s at inspection 16 May 1944. In 1933, a 983-foot runway was completed on the Waimanalo Military Reservation and that area was renamed Bellows Field, an auxiliary airfield to Wheeler Field. Bellows Field became a separate permanent military post in July 1941. 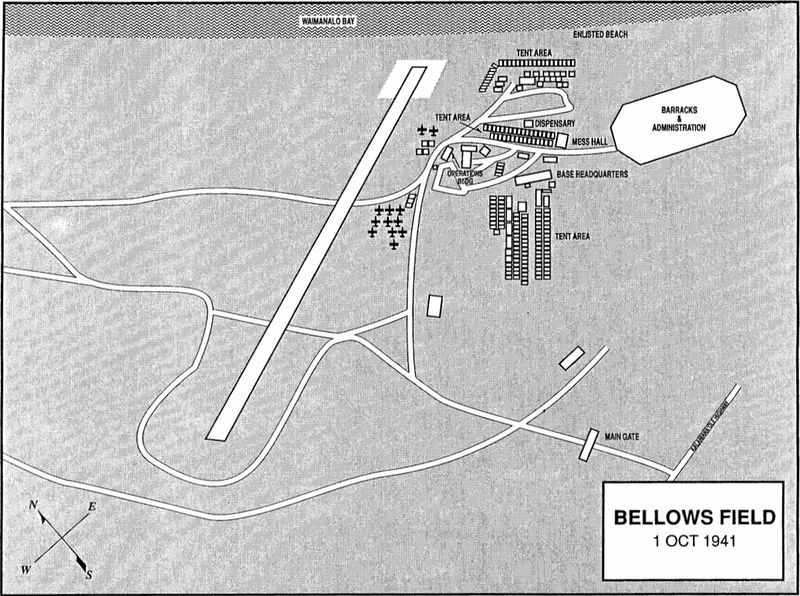 Bellows Field Plan 1 Oct 1941. On 7 Dec 1941, Japanese aircraft attacked Pearl Harbor and other installations around the island including Hickam Field and Wheeler Field. At Bellows Field two were killed and six wounded. One B-17 Fortress made an emergency landing at Bellows during the attack. At Bellows Field a Japanese sailor and his midget submarine washed up off the end of the main runway. The sailor became the first Japanese prisoner of war. Bellows Field remained active as a training field throughout World War II. Three runways of 6,300, 4,900 and 3,800 feet were built during the war. 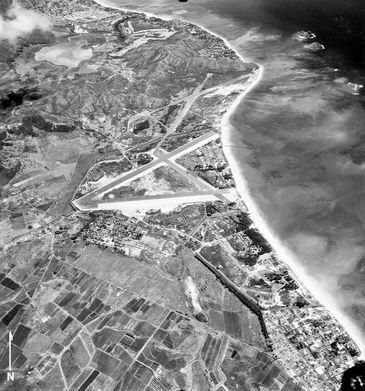 With the creation of a separate U.S. Air force, Bellows Field was renamed Bellows Air Force Base in March 1948, In 1958, it was renamed Bellows Air Force Station and the runways were closed. Use by the Marines for amphibious, ground, and helicopter training increased during the 1960s. The U.S. Army built two Nike-Hercules anti-aircraft missile sites at Bellows in 1960. The Nike Missile Launch site, OA-32L was located near Bellows Field while the control site, OA-32C has located in the hills overlooking the base. All the Nike sites on Oahu were closed in 1970. The facility then became a communications site. Bellows Air Force Station is now a recreational area and most of the acreage is part of the Marine Corps Base Hawaii. The Marines use it for amphibious, helicopter, and motorized training. It is currently the only place in Hawaii where amphibious landings can transition directly into maneuver training areas. Location: Waimanalo, Honolulu County, Hawaii.